Make yourself at home in one of the 4 air-conditioned rooms featuring kitchens with refrigerators and stovetops. Complimentary wireless Internet access keeps you connected, and flat-screen televisions are provided for your entertainment. Conveniences include microwaves and coffee/tea makers, and housekeeping is provided on a limited basis. BacHome Terrace B&B is located in central Barcelona, 500 metres from Plaza Catalunya and Passeig de Gràcia. This modern bed and breakfast has a spacious decked terrace with sofas and offers a buffet breakfast. The air-conditioned rooms at BacHome Terrace B&B feature modern décor and free WiFi. Each one comes with a desk, a private bathroom and views of the street or the terrace area. Their bathrooms include a hairdryer and free toiletries. BacHome Terrace B&B offers a breakfast buffet, which can be eaten on the terrace. Located 500 metres away, Portal de l’Àngel Street is full of shops, and there are numerous charming cafes and restaurants in the Gothic Quarter, 5 minutes’ walk away. The beautiful Palau de la Música Auditorium is also 450 metres away. Located 150 metres away, Urquinaona Metro Station connects you with the rest of the city with ease. Airport buses leave from Plaza Catalunya, 7 minutes’ walk away. With a stay at Yurbban Trafalgar Hotel, you'll be centrally located in Barcelona, just a 3-minute walk from Palau de la Musica Catalana and 7 minutes by foot from Placa de Catalunya. This hotel is 0.4 mi (0.6 km) from Barcelona Cathedral and 0.4 mi (0.6 km) from La Rambla. Make yourself at home in one of the 16 individually decorated guestrooms, featuring minibars and LCD televisions. Complimentary wireless Internet access keeps you connected, and satellite programming is available for your entertainment. Bathrooms have designer toiletries and hair dryers. Conveniences include safes and blackout drapes/curtains, and housekeeping is provided daily. With a stay at Hotel HCC MontBlanc, you'll be centrally located in Barcelona, within a 5-minute walk of Palau de la Musica Catalana and Placa de Catalunya. This hotel is 0.3 mi (0.5 km) from Barcelona Cathedral and 0.3 mi (0.5 km) from La Rambla. The 3-star BCN Urban Gran Ducat is ideally positioned in the centre of Barcelona outside Plaza Catalunya Square, a short walk from the Spanish Quarter, the Ramblas and Gaudi’s magnificent Casa Batlló. Rooms in the 19th-century building are bright and air conditioned, and come with free wi-fi and satellite TV. Breakfast is served in the Gran Ducat’s dining room, and for evening meals there are plenty of excellent restaurants and tapas bars in the local area open until late at night. Tourism Register of Catalonia HB-004122 DC79. 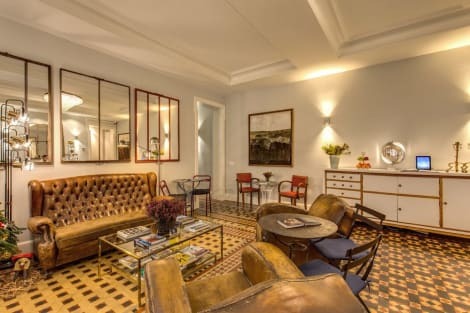 With a stay at We Boutique Hotel in Barcelona (Eixample), you'll be a 3-minute walk from Arc de Triomf and 9 minutes by foot from Palau de la Musica Catalana. This hotel is 0.5 mi (0.9 km) from Picasso Museum and 0.5 mi (0.8 km) from Barcelona Zoo.